The breed was first imported from France into the UK in 1976. The breed is centred around the town of Charolles in the Saone Loire region of France where is grazes alongside the famous Charolais Cattle. Since that time it has grown in popularity and is currently probably the 2nd most numerous terminal sire breed for the UK . 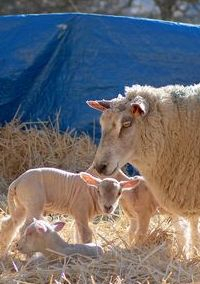 Easy lambing – Charollais rams will without question give shepherds (and ewes) easier lambing. The skeletal structure of the breed; without heavy bone, broad shoulders or big heads makes lambing a joy. First time users of the breed cannot believe how easy birth is with the breed. Fast growth – growth rates for Charollais cross lambs are excellent. Their length, wide loin and good hind quarter confirmation mean heavy, well-fleshed lambs. Single lambs can achieve weights of 40kg in just 8 weeks . The Charollais breed is managed by one of the most progressive thinking Societies in the UK . The objective of the Society is “to promote, develop and improve the breeding of Charollais Sheep in the UK ”. To achieve this we undertake projects with a number of organisations to improve the quality of the Charollais breed and ultimately lamb meat for the consumer. The Society organises a variety of events to promote the use of Charollais to commercial farmers. It also runs a programme of conferences, meeting and training days to help our breeders keep abridge of new developments in the prime lamb industry.